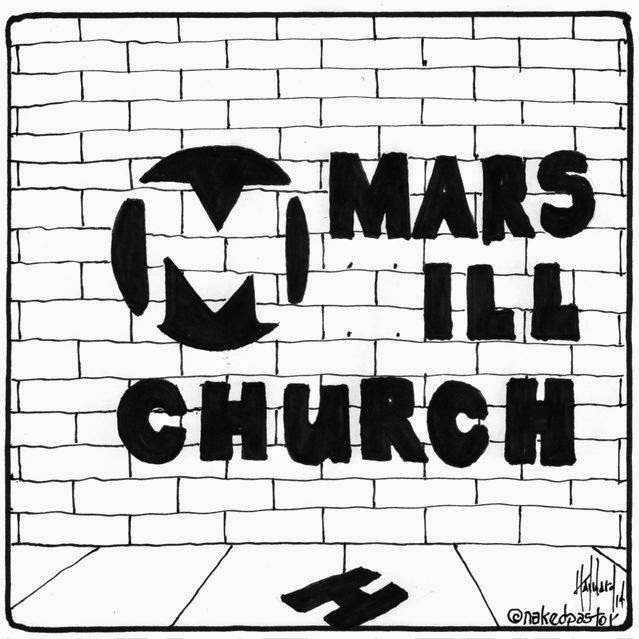 October 2007 - Mark Driscoll moves to change the by-laws of Mars Hill church; the change would consolidate power with Driscoll and a smaller group of elders handpicked by Driscoll. Two highly respected elders (Paul Petry and Bent Meyer) at Mars Hill resist this change, and are fired when they try to hold Driscoll accountable. ▪ Under Driscoll's leadership, Mars Hill is one of the first churches to go "multi-site," in which a pastor's sermons are piped in via video screen. 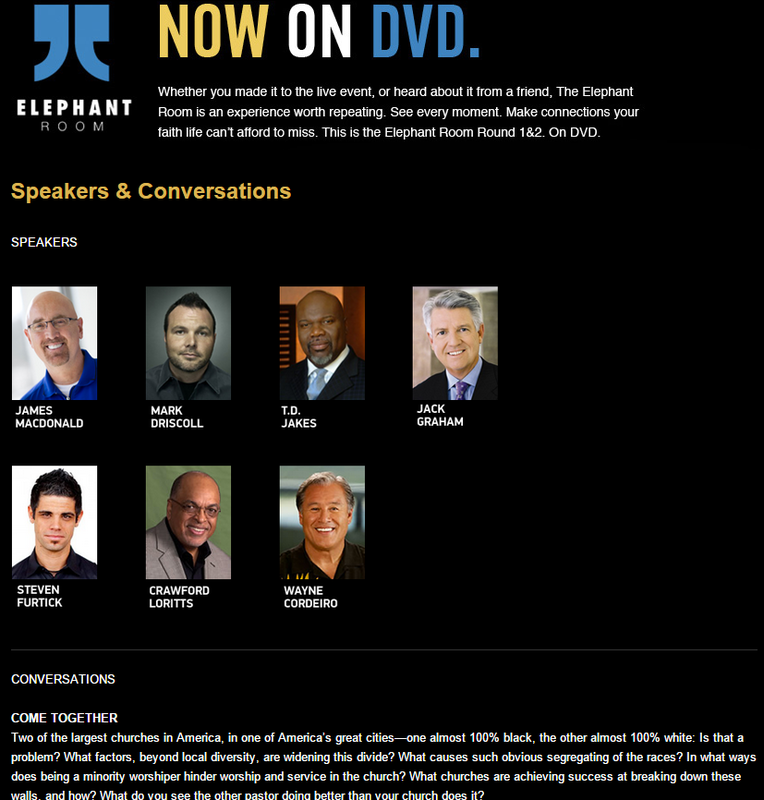 January 25, 2012 - Driscoll hosts an event entitled Elephant Room 2 (the first one having been the year prior) in which he features Oneness Pentecostal teacher TD Jakes, who holds to an unbiblical, non-Trinitarian view of Father, Son and Holy Spirit. Jakes is also a prosperity/Word of Faith teacher who is known for his lively ability to $hakedown the flock for ca$h. Pastor Chris Rosebrough, an outspoken critic of syncretism and ecumenical alliances, attempts to attend the ER2 event, having paid and registered for it online, but is charged with arrest at the door if he enters the building where the event was taking place. 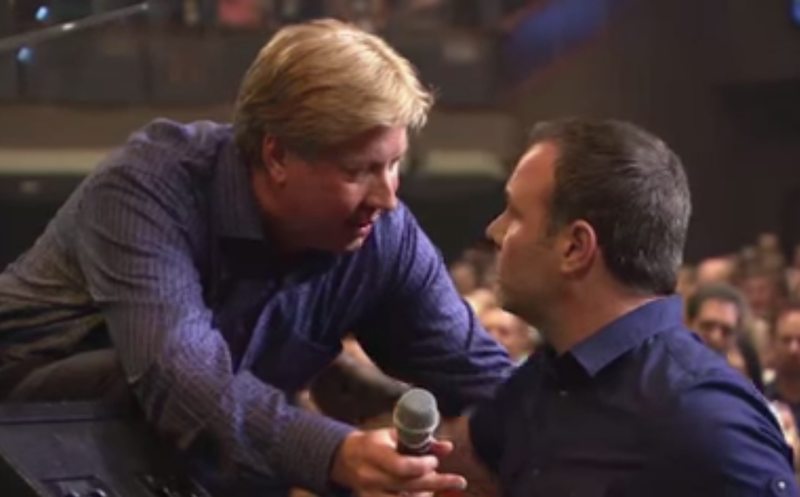 Several Christian writers begin asking questions about why Driscoll, an evangelical Christian, would affirm heretic TD Jakes as a Christian brother at this event (here, here, here, here, here, here, and here). This event proves to be a pivotal point, after which concerns about Driscoll begin to grow as more and more eyes are on him. 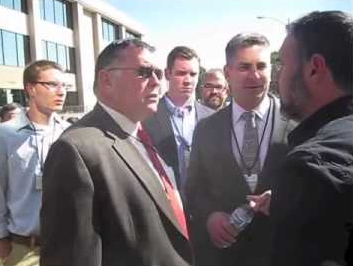 October 18, 2013 - Mark Driscoll stages a bizarre publicity stunt at the Strange Fire conference that backfires on him after security personnel treat Driscoll far more graciously than he apparently anticipated. He leaves the event and begins broadcasting on social media the lie that security personnel had confiscated his materials. In reality, he had handed them over as "a gift" (his words). Video surfaces later that documents the encounter, and shows that Driscoll lied. November 21, 2013 - Christian talk show host Janet Mefferd interviews Driscoll, and asks him about plagiarism in his newly released book A Call To Resurgence. Mefferd, in preparation for her interview with Driscoll (who is making the rounds on talk shows promoting his new book), had read Driscoll's book prior to her interview with him, and had discovered several instances of plagiarism. Janet came under heavy fire for asking Driscoll these questions, and her show producer ended up resigning in the midst of it. March 6, 2014 - Pastor Chris Rosebrough of Fighting For the Faith radio reports that Mark Driscoll bought his way onto the New York Times Bestseller List "through anonymous third parties". Warren Throckmorton of Patheos publishes the contract that was in place for artificially inflating book sales for Driscoll's book Real Marriage. July 30, 2014 - Dr. Paul David Tripp resigns from the Mars Hill BoAA, later calls Mars Hill "the most abusive, coercive ministry culture I’ve ever been involved with"
August 1, 2014 - More allegations of plagiarism by Driscoll emerge. Warren Throckmorton of Patheos publishes a chart that documents plagiarism in seven books authored by Driscoll. August 13, 2014 - NPR (National Public Radio), a secular media outlet, reports that Lifeway Christian Stores have halted sales of Driscoll's newest book (A Call To Resurgence) due to Driscoll's having been "accused of plagiarizing sections of the book and artificially inflating his book sales by bulk-buying copies." October 15, 2014 - Mark Driscoll resigns from Mars Hill church, defiantly claiming however that he is not "disqualified from future ministry"
As noted, this is not an exhaustive article. For a more comprehensive timeline, please see our article Documenting the Problems with Mars Hill Pastor Mark Driscoll, as well as Warren Throckmorton's posts at Patheos.